Many of you may not know this, but I am a HUGE fan of Thug Kitchen. I find their recipes delicious, and their offensive language commentary, hilarious. 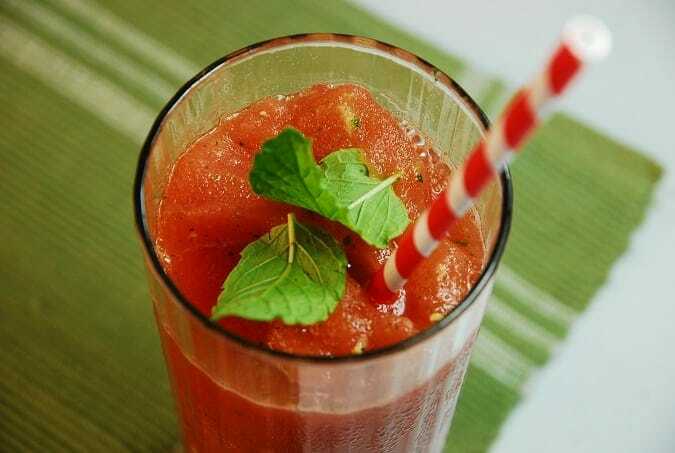 Recently, I came across their Watermelon Cucumber Slushie Recipe, and I thought that would make a perfect Weight Watchers Summer Drink Recipe. I also needed a good, alcohol-free drink recipe for my Labor Day BBQ that both adults and kids would enjoy, and so I got to work giving these a try. They were FANTASTIC!! They were cold, sweet, and delightfully flavorful. I barely even made any tweaks to Thug Kitchen’s original recipe. If you don’t want to use coconut water, plain old water will work just fine too. And if you prefer an adult version of this, white rum is a great replacement for the coconut water. This is a delicious and unique drink recipe that is a perfect summer treat, so while we still have these last few days of summer, get out that blender and whip up one of these Watermelon Cucumber Mint Refreshers – they are divine. Cool, refreshing, and deliciously sweet, this is one summer drink recipe that you must try. Perfect for a backyard summer BBQ. It’s also full of vitamins and antioxidants, and is a drink the kids can enjoy too. Freeze watermelon chunks for at least four hours or overnight. In a blender, combine frozen watermelon chunks, along with remaining ingredients. Puree until smooth. Pour evenly into 6 glasses.